I just wanted to pop in quickly to share an amazing, exclusive sale promo with you! If you're a PayPal member and an avid Ann Taylor shopper, then this is your special day! Now through Sunday, 10/22/17, you can get 50% OFF at Ann Taylor when you pay with PayPal and apply promo code "PAYPAL" at check-out! This promo is being offered for a very limited time in honor of Ann Taylor's recent addition of a PayPal check-out option. Woohoo! This exclusive promo ends Sunday night at 8:59pm PST / 11:59pm EST. Promo cannot be combined with any other offers/promotions. So, if an item is already on sale for 40% off (as some select items currently are at AT) then the 50% off discount will be applied to the original retail price only. 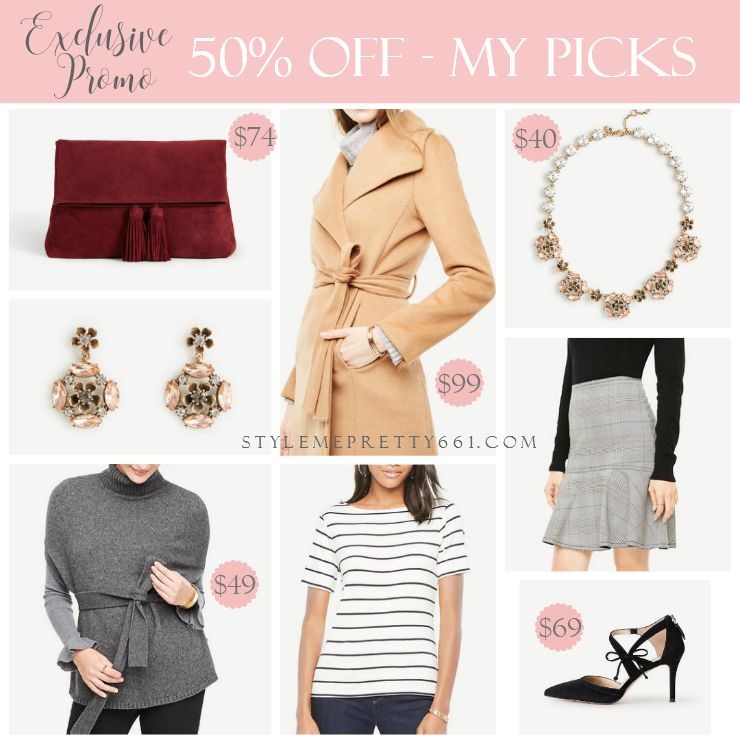 Ann Taylor is now offering 50% OFF + FREE shipping with code "SOGOOD"! Sale is valid online and in stores, but hurry -- it's only valid today, ending at midnight PST / 3am EST Friday, 10/20. This is the perfect time to score your favorite AT goodies at half off, especially those pricier ones like coats/jackets, sweaters, and shoes you've had your eye on. The free shipping sweetens the deal even more! Start shopping here! I rounded up a few of my recent AT faves in the collage above, including this camel wrap coat that comes in both regular and petite sizing. I adore the color and sleek styling. I had picked up this similar one from H&M a few months ago and love it, though it's a bit longer on me. You can see it on me in this blog post for reference, in case you missed it. As you can see, the AT coat is very similar. I may order size XXSP just for comparison's sake and keep the one I like more. You really can't beat $99 for a classic, versatile coat that will last you season after season! Also, how darling is this turtleneck poncho? I love that it has self-tie belt to help cinch your waist, giving you more of a flattering shape than most ponchos. Hallelujah! And this luxe tassel clutch from last year is back in the same rich bordeaux ("vino") color as well as a pretty blush color ("paloma") and black. The fold-over style is so chic and will pair perfectly with casual outfits and dressier ones alike. The only question is, which color to nab? They're all so beautiful! If you've been on the hunt for a classic, striped tee, try this one! It's only $24.75 with the promo, comes in regular and petite sizing, and is the quintessential top that can be worn on its own or layered under your favorite vests and jackets. I love it layered under this blazer as shown in the stock image.